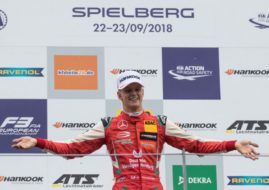 Prema Powerteam’s Callum Ilott scored his fifth win of the season in the FIA Formula 3 European Championship race at Red Bull Ring in Spielberg, Austria. The 18-year-old British driver started the first race of the weekend from pole and converted it into the victory after 25 laps around the 4.3km Grand Prix circuit. Joel Eriksson (Motopark) and Maximilian Günther (Prema Powerteam) completed a podium. Championship leader Lando Norris (Carlin) finished in the fourth place after the last lap move against Tadasuke Makino (Hitech). Other point-scorers are Ferdinand Habsburg, Mich Schumacher, David Beckmann, Guanyu Zhou and Pedro Piquet. Norris has a big advantage of 60 points in the championship standings in front of Günther. Today’s win promoted Ilott to P3 in the championship, two points ahead of Eriksson. Two more F3 races are scheduled for tomorrow at Red Bull Ring.